Worrying about how your ad campaign for your car dealership is converting? You should. You have a lot at stake when crafting an ad campaign for your car dealership or cars on the lot. Today’s article in the landing page series will show you the tips and tricks you need to create a successful ad and landing page combo for Google AdWords. Use specific keywords. You want your ads to be as targeted as possible. You don’t want your ad appearing for something irrelevant to your advertisement. Focus on long-tail keywords. Keywords such as “mazda” are really pricey and aren’t specific enough. Try something more specific like, “used mazda 3” to get better conversions and lower costs per keywords. Make sure to target your location. This is very important for auto dealerships to remember. Geotargeting allows you to target the location of your audience in a variety of ways, such as by city, postal code and radius. Use CTA copy to enforce urgency. Use a phrase such as “call now” to prompt Google users to click on your car dealership’s ad. If you’re featuring a specific make or model of a car, include specific car features & starting price in the description copy. If you’re emphasizing on the benefits of your car dealership, also point out the benefits. What makes your business better than the one across the street? In-house financing? Free warranty? Use ad extensions to take up more space with your ad & to increase click-through rates. Car dealerships should try out the call extension, location extension & sitelinks. Make sure to track & tweak the results of your campaign. This is imperative for achieving good conversions. Use retargeting to target lost leads that clicked on your car dealership’s ad but didn’t end up converting. Think about the conversion goal - Are you trying to convince someone to be interested in a certain make, model or dealership? This question is key to determining the direction of your landing page. Make sure you only have one conversion goal on your page. You shouldn’t include a navigation bar or links to multiple offers. Know what the goal of your ad campaign for your car dealership is. Feature a limited-time offer if possible (such as a deal of the week) - these are effective in increasing urgency and scarcity. Contrast the call-to-action (CTA) with the page’s background color. Use directional cues to point your visitors towards the form or CTA button on your landing page. Focus on the benefits of either your car dealership or the vehicle you’re offering. Do not attack the competition. This can cheapen your brand and make your car dealership seem tacky. Use the absolute minimum number of form fields you need for your offer. The more form fields you use, the less conversions you will get get. Make sure your landing page is optimized for mobile (most landing page builders have this feature). Many people will be searching for car dealerships on their mobile devices! I’m pretty sure that this auto manufacturer doesn’t need an introduction. What is questionable about this ad is the fact that it comes up for the search, “mazda3 for sale” as we know that this is a different model and make. I get that they’re trying to grab some clients from mazda as the 3s are a very popular car, but don’t do that with your PPC campaigns. The main focus of an ad on Google is for the user to find what they are looking for. Not something similar. Always make your ads relevant to your search terms. Hyundai would get better conversions with different keywords like, new sedan, hyundai, elantra, etc. What’s also confusing about this ad is that they have included both two different models of cars in their display URL. If this ad appeared for more relevant search terms I would think that it would generally be a good ad. It details the starting price, selling points of the car, where you can get it and who you can phone to inquire. Let’s move on to the landing page. Woah, lots of info on this page! The directional cue. Hyundai uses an arrow to direct below the copy below the fold, “Elantra takes on the competition.” They also tell you to scroll. Click and scroll. Hyundai’s page has elements that seem like they’re going to navigate you away from the page, but instead lead you further down the page to detail the features of the car. It’s visually appealing. Although the design of the page isn’t ideal for the page, here was definitely some thought put into the layout. I appreciate that. There’s no headline. There are a lot of things going on when you navigate to this page, but there is no clear statement. “2016 Elantra” won’t do on a landing page. It needs to make either the dealerships or the car’s selling points clear. Nothing really pops. The blue does stand out on the landing page, but there are far too many elements with that color that you don’t really know where you should start. It’s a little tacky. Their main selling points on the page are directly targeting the competition. Here’s one example referring to Hyundai’s heated rear passenger seats, “...Civic and Corolla? They don’t even offer it-that’s cold.” I feel that it cheapens the brand a bit. A singular CTA. When I navigated to this page, I had no idea where they actually wanted me to click. There are way too many similar buttons to click on. A different number of form fields on the click-through page. There are over 20(!) different form fields on the follow-up page to the “get a quote” CTA button. Decrease these significantly to get more leads. I would try to cut it down to less than 10. Including less information on the page. It’s important for certain pages on the website to detail all of the aspects of a vehicle, but not on a landing page. Odds are that the people searching for the exact vehicle they want already have some information about it. Emphasizing the selling points without attacking the competition. I understand this tactic, but I have seen plenty of successful landing pages that don’t resort to this type of marketing. Try including the benefits without mentioning the competition. National Car & Truck Sales are an innovative car dealership that doesn’t have salespeople, receptionists, business managers, etc. What makes them appealing to buyers is that they charge significantly less per car because they don’t have staff (don’t ask me how this works). I feel like they could have done a bit better with the copy on this ad. They have a unique business model and I feel like they could capitalize on the fact that their vehicles are being priced thousands of dollars less than the same vehicle new. It’s not a bad advertisement, though. A lot of car dealership ads I’ve seen don’t include a location extension or sitelinks (hyperlinks at the bottom of the ad). What a change from the first landing page! It’s so simplistic. The whitespace. There’s lots of room for the page elements to breathe. This landing page isn’t squished together and doesn’t include any elements they don’t need on the page. The logo. National is a trusted car dealership that is based mostly on Vancouver Island. As far as I know they have a good reputation on the Island, so it bodes well for them to feature their logo as a trust symbol. The CTA button. The CTA on the right (above the fold) is huge! That’s awesome, you can’t miss it. The light green is also easy to see on top of the dark green. The customer testimonials. These are very important aspects of a landing page for a car dealership. I remember when I was looking for a dealership, and I spent a good amount of time looking at a dozen different dealership’s reviews. The CTA button on the photo. Usually I’m a fan of multiple buttons for the same offer on a landing page, but this one seems unnecessary and distracts from the photo of the Mazda. An arrow. Arrows act as a directional cue to guide the visitors attention on the landing page. 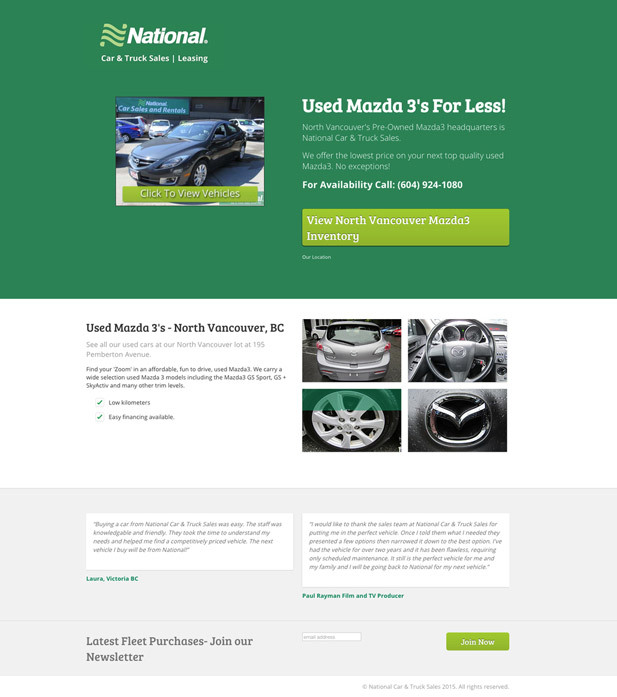 Directional cues are used to point the visitor to the conversion goal of the page (in this case, the “View North Vancouver Mazda3 Inventory”). A picture of a person. Photos of people convert well on landing pages. I would test including a photo of a person and the car they just bought on the landing page to show excitement. A prominent call button. Car dealerships want calls - there’s no doubt about that. Give landing page visitors the easy option by letting them conveniently call to inquire about your car selection. Sometimes people just want to get straight to the point instead of browsing the inventory. I would contrast the color of the button with the page. A form. A standard feature to test on your landing page - if you put a form directly on this page instead of clicking-through to another page with a form on it, it would become a lead-generating landing page. I would suggest a two-step opt-in form on the page. The headline. I love this headline, as it’s very representative of what Mazda wants to achieve with their Mazda3. It’s catchy, exciting, and makes you want to keep reading. The video. Having a video take the place of your hero image is exciting - it provides movement and is awesome for an automotive landing page to show off a vehicle. The directional cue. The arrow under the video shows the viewer that’s there’s more to see. It always helps to have one of these on a landing page. The award. Highlighting a safety award is great when trying to convince potential owners that your car is right for them. The CTA buttons. The CTA buttons are very clear, and there’s one in every section. Simple, great usage of CTA buttons. The “What’s Trending” section. The subheadline implies that these are tweets containing “#Mazda3 or #DrivingMatters”, but they’re not - and the tweets that are featured don’t do much to sell the vehicle. The “Top Features” section. This section really doesn’t help because the viewer needs to click through to actually learn anything. I’d turn the “chopped” headlines into full sentences and then add “learn more” buttons. A better gallery. Currently, the gallery is a full-width carousel. It’s okay, but it’s actually quite hard to know that it’s a gallery to begin with. I might try using a collage layout of some sort to show quick scrollers more of your vehicle. More copy. For how long this automotive landing page is, there’s actually not too much information. I’d test incorporating more copy to see if it improves conversion rate. The hero image. The image is dynamic and exciting; I like how Lexus let it “pop out” of the frame. It’s a creative way to show off the vehicle. The gallery. I like that the gallery is creatively laid out, with a combination of photos and videos that show off the IS’ features and associated marketing campaigns. The “IS Styles” section. The copy in this section is great and varies greatly between models, serving to highlight the difference between each IS style. Highlighting the horsepower, MPG, and other important options in large font is a great way to show people what they’re likely to care most about. The CTAs. Though (like most automotive landing pages) there’s more than one CTA on this page, they’re not clear enough. I think having more “Build Your IS” CTAs would be great for the “Explore & Customize” and “IS Styles” sections. Lack of on-page information. I think adding a section on features would have added a lot to the page - currently, it’s hard to learn much about the IS without going to a page that’s not optimized for conversion. More copy. Again, this automotive landing page doesn’t offer much in the way of information. This page is 90% images - and it doesn’t really give potential buyers the information they need to make an informed decision. A contrasting CTA color. I know that Lexus chose black CTAs to create an image of luxury, but this doesn’t do much to draw viewers’ attention. There’s already a bright, contrasting car color in the hero image - I might try a red CTA to match, which would almost certain improve click-throughs. The hero image. Audi has been working hard to create an image of “futurism” in their cars. The cold colors and sleek look of their hero image establish the tone for the whole page, while making the car look attractive. The video. The video on this automotive landing page does a great job of continuing that futuristic tone while showing off the styling of the vehicle itself. It’s a great way to continue establishing the character of the car while highlighting product features. The copy. The copy on this automotive landing page is great because it highlights, in detail, the features of the car and its various models. It’s feature-focused, which can be good for discerning buyers. The “post-headline pre-headline”. Confused? Me too. The “Sportiness and elegance” headline (if you can call it that) is totally out of place on this page, and doesn’t add much to the surrounding content. The CTA buttons. Or, more accurately, the lack thereof. This page literally has zero CTA buttons. Even if this page is just to inform potential buyers, it should be Audi’s goal to sell more cars, right? Adding a “book a test drive” or “build your A5” CTA would change the page for the better. Less copy. I like the copy, but there might be a bit too much. I’d tone it down, or split it up into bullet points to make it more easily digestible. Relevant images to match the copy. The copy highlights certain features, but you can’t actually visualize these features because they’re not displayed in any images. Changing or adding images with relevant copy would help the user experience greatly. The CTA buttons. Finally, a company that follows best practices - Toyota’s bright red CTAs draw attention to the conversion action they want their viewers to take. They use red text for their less important CTAs (“compare models”, “learn more”, etc. ), which is a great way to establish hierarchy of elements. The award. Toyota highlights their 2017 IIHS Top Safety Pick award front-and-center by having it overlaid on their hero image. This shows they understand their target market - people looking for a high-value, safe, reliable car. The “highlights” section. I think every automotive landing page should have a section like this. It features clear headlines, expanded information on certain features, and images to go along with these features. This is a clear way to share important details about your vehicles. The galleries. Though I like that Toyota split their galleries up into different categories, I don’t like that they take you to a different page. I would’ve preferred a lightbox, which could serve the same purpose while keeping viewers on the page itself. The headline text. Well, the big problem is that there isn’t any. Not having headline text means one less way to set the tone for the page and product - it’s really not recommended. Changing font sizes. Turns out there may actually be a headline, it’s just hidden. There’s a small piece of copy that says “Your next chapter starts here.” Just blowing that up and laying it on top of the hero image would make a great headline. CTA text. “Build” isn’t quite so enticing as a main CTA. I’d explore something more direct and action-oriented, like “Build Your Corolla”. This little change could definitely go a long way towards increasing conversions. Click to scroll. I like that the main “build & price” CTA scrolls the viewer down to the bottom of the page, instead of sending them to another landing page. The topical promotion. I like that Honda highlights (high up on the page) a Presidents’ Day sale, which is seasonally relevant. Large images. Though there might be too many of them throughout the page, the images are great and the accompanying copy helps to highlight the car’s special features. It’s too big. Even on the Wishpond office’s fibre-optic internet connection, this automotive landing page took quite some time to load. Seriously - this page is huge, making it annoying to navigate, because of its many large images and moving parts. Repetitive sections. Not only is this page too long - it hides content within its sections, making the page totally bloated with information and not streamlined at all for its viewers. No headline. You’d think for such a huge page, you’d remember a headline! Not having a headline means the page begins without much focus - that’s not what you want. A shorter page. I know I’ve talked about this already, but I’d test shortening the page significantly. I think this would force Honda to choose only information that’s essential and improve user experience greatly. The hero section. I like that Ford highlights the different Focus models within the hero section of this automotive landing page, along with the different colors available for the vehicle. I also like that they show important details right below this section, like the price, MPG, and seating. The lightboxes. Clicking on images in the collage section opens up a lightbox, allowing viewers to see images in high detail without leaving the automotive landing page. The technology features section. This section is great because it pairs explanatory images with copy that explains how each feature works. The typography. I think something may have gone wonky in Ford’s backend styling, because the line height of the paragraphs on the page make it quite difficult to read. The video section. Again, this section looks a little broken. In general, Ford needs to look through this page again and fix up a lot of their styling. A new headline. There’s no actual headline besides “Ford Focus”, but that works in the context of the page. However, I think a more lifestyle-oriented headline (like the later-used “Inspired. By Design.”) would do great, too. Less variance in CTAs. There’s a lot of different CTAs on this page - and most of them are different. Though this is great to inform customers, it’s not great for increasing conversions and sales. The hero video. This dynamic video shows off the “feeling” the car is meant to evoke: it’s exciting and adventurous, and makes the above-the-fold portion of this automotive landing page enticing. The accolades. The featured awards, accompanied by text saying “People love Subaru” helps to provide social proof - other people like Subaru, so the page viewer should, too. I like that they’ve also added a review excerpt below this section. The gallery section. The gallery section opens into a full-screen carousel view that makes it easy to appreciate the high-quality photos Subaru has taken of the BRZ. I like that closing the gallery takes the viewer right back to the landing page. The features section. Currently, most of the bullet points under the features are too vague. There’s not enough details to convince a skim reader that they need the BRZ. On top of that, clicking into a feature opens a new page; I wish it would simply expand with an explanation below. It’s not focused. Though there are CTAs, the most important one is “Shop BRZ” - which only appears on the navbar. Even if Subaru doesn’t want to change their “learn more”-type CTAs, I think including more high-intent CTAs would help their CTAs. More testimonials. I really like the testimonial at the bottom of this automotive landing page - I think adding small testimonial sections between the others would help increase social proof and conversion rate. The hero section. Contrary to what I’ve said often in this article, I don’t mind the lack of a headline here. I like that the hero section clearly highlights the car and important specifications, including price, horsepower, and MPG. The movement. You can’t see it from the screenshot, but this automotive landing page has subtle movement throughout the page that makes it exciting and engaging. This is a recent design trend that’s starting to make the rounds, showing that Acura is on top of their design game. The ratings carousel. Finally! This is something I’ve wanted to see the entire time I was writing this article. The review section compiles (in a clean and visually pleasing manner) positive reviews about the ILX from different, reputable sources. The offers.Acura highlights in a carousel near the top of the page several offers that are currently running for the ILX. This is great because it incentivizes viewers to act. They feature a CTA (“Current ILX Offers”), encouraging readers to buy an ILX. Not enough CTAs. Honestly, this is the only thing I can find about this page. Acura could’ve added more “learn more” or “build” CTAs. Because this automotive landing page features so much white space, it doesn’t hurt to add a CTA or two in sections without them to increase conversions. A headline. I know, I know. I said I didn’t mind it earlier, but it also wouldn’t hurt to test a headline that evokes more of a “personality” for the car. Considering how awesome this page is, I think a high-energy headline could do wonders for it. The intent. There are four “Build & Price” CTAs on this page, which is almost undoubtedly more than any other automotive landing page I’ve reviewed in this article. I like that these (bold and contrasting) CTAs are everywhere on the page - Jeep wants you to buy a Wrangler, and that’s clear. The interactive build section. Potential Wrangler owners can see what their chosen options look like (and how much they’ll cost) in the interactive section towards the top of the page. Choosing different options (like colors, tops, and doors) instantly changes the image, allowing people to clearly see what their car might look like. The highlighted features. This is as simple (and good) as it gets. 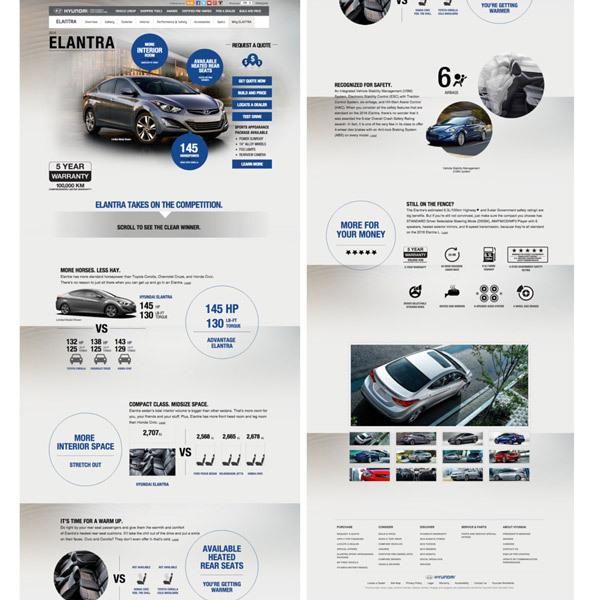 Having key features, accompanied by photos of these features, is all an automotive landing page needs to showcase important aspects of a vehicle. Jeep does this multiple times on the page, and it’s really effective. Too much text in the hero section. Because there’s already a section that highlights the different Wrangler models lower in the page, I think the subheadline text is unnecessary in the hero section. Too much text in general. Though I like the way they highlight the features (as mentioned earlier), this page is a bit text-heavy. I would have added (or increased the size of) images to give the text more room to breathe. A hero video. One of Jeep’s large selling points is its “action-oriented” brand image. For a vehicle that’s portrayed as an “outdoorsy” one, a hero video can really help to push the idea that a Jeep is built for the elements. I’m nitpicking, though - overall, I think this is a great page. The layout. This page is gorgeous, not least of all because it’s laid out in a way that’s clean and cohesive. The images work perfectly in harmony with the text to create a page that’s totally enticing. The directional cue. The simple arrow above the fold (which bounces, by the way!) pulls the reader into wanting to learn more. The copy. This copy really stood out to me - though it still mentions features (as all of the other pages do), it’s focused much more heavily on benefits. It highlights clearly what a driver might think or feel when driving a Huracan, and is generally much more oriented towards emphasizing the driver experience. The lack of CTAs. Backwards? No. Lamborghini knows it’s a high-class brand - if you’re a car enthusiast, you want one and they don’t need to convince you of that. Limiting the number of CTAs to only one (“customize now”) shows Lamborghini’s confidence in their product, and is totally in line with their brand image. Honestly, not much. This automotive landing page is nearly perfect for the function it’s meant to serve. There’s no big weakness that stands out to me. More instances of the “Customize Now” CTA. Though less CTAs overall makes the page look more elegant, adding more “Customize Now” CTAs could help Lamborghini get more buyers. It’s tough to say, because a luxury car manufacturer relies much less on high volume for business. Hopefully I’ve given you some neat ideas to test on your own landing pages - whether or not you’re optimizing for a car dealership. Got a great ad & landing page combo? I’d love to critique it… send it my way in the comments section below or via Twitter.